There has been what readers of Western literature might consider a Gabriel Garcia Marquez-ness to the titles of many films rolling out of Mollywood over the years. The latest poetic moniker is debutant director Domin D’Silva’s Paipin Chuvattile Pranayam, Love by the (Water) Pipes, a story of romance blossoming in a seemingly impossible socio-economic situation. Paipin Chuvattile Pranayam is set on Pandarathuruthu, which is facing a severe water shortage despite being surrounded by a kaayal on all sides. The polluted lake water is unfit for drinking. This one factor pervades every aspect of the local populace’s life, with fights at the community tap a common occurrence, parents seeing marriage as an escape from this hellhole for their daughters and families from elsewhere averse to marital alliances with the men of this village. Pandarathuruth lies a universe away from the city just on the other side of the lake. It is the sort of place media bosses and politicians ignore. In this dismal scenario, we meet Govindankutty/Govutty (Neeraj Madhav), a hard-working and resourceful young fellow who earns a living from freelance painting jobs, fishing and assignments for his dance troupe comprising local youth. Govutty and Teena (Reeba Monica John) are in love, but her parents are opposed to the relationship. Paipin Chuvattile Pranayam is about love surviving overwhelming odds, laughter thriving in a forbidding setting, the human capacity for optimism even when tragedy strikes, and the water wars we should be prepared for if we do not heed glaring warning signs. Environmental degradation is a depressing subject, yet somehow, without trivialising the issues at hand, D’Silva manages to give his film a consistently light touch. By foregrounding Govutty’s relationship with his buddies and his romance with Teena, the writer-director cleverly ensures that this remains a relatable even if educative human story rather than an esoteric documentary. Complementing his intelligent screenplay (co-written with Antony Jibin) is a sturdy cast, an atmospheric soundtrack and thoughtful cinematography. 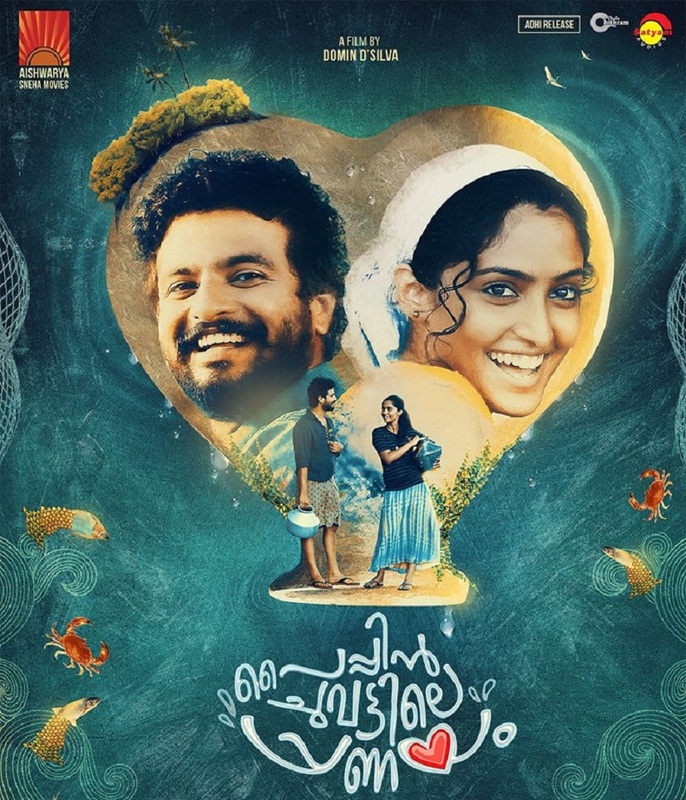 Neeraj Madhav, for whom Paipin is his first screen outing as the solo male lead, justifies the director’s confidence in him. He carries the film on his able shoulders from start to finish without flinching for a moment. He is an excellent actor, a sweet-looking man and a good dancer. In fact, it was clever of the screenplay to assign dancing as a talent to Govutty, since this gives the film the opportunity to tap Madhav’s natural skills and makes an important plot point (involving a citizens’ protest) believable. When Govutty’s group gets a high-profile platform in the state, choreographer Sreejith Dancity gives them impressive moves with just enough rough edges to make them credible as coming from a team lacking exposure and professional training. This is not about giving characters screen time alone. It is about writing them with depth. Govutty’s feisty grandmother, for instance, is not visible as often as Teena, yet she is well fleshed out (and well acted) and memorable because of that. To be fair to D’Silva, this folly in the script cannot be blamed on the male gaze alone. Govutty’s friend Ayyappa is a wholesome character – excellently acted by Sudhi Koppa – but Rishi Kumar’s character has recall value for the actor’s voluminous Afro hairstyle and nothing else, and the younger boy pals for not even that. One thing that can certainly be blamed on the male gaze though is the sexualisation of the little girl who is followed around and gaped at by those boys, and is shown enjoying the attention. She looks like she could be a pre-teen, they are not much older. Even if such behaviour does exist in reality, please stop projecting it as cute. It is not. Not only are these brief scenes an absolutely needless aside, they are also disappointing considering that D’Silva & Co manage to portray the Govutty-Teena relationship without a hint of stalking or leering – male behaviour that is normalised in too many other Malayalam films. Paipin Chuvattile Pranayam is technically refined. DoP Pavi K. Pavan captures the beautiful locale in all its visual glory, yet his matter-of-fact, un-self-conscious style ensures that the camerawork never diverts our gaze from the people at the heart of this tale. Bijibal has notched up yet another winner with his music for Paipin Chuvattile Pranayam. Although his songs for Maheshinte Prathikaaram remain the jewel in his crown, this one is pretty neat too. In fact, the melodic title track – with remarkably conversational lyrics by BK Harinarayanan – is a perfect précis of the plight of Pandarathuruth. ‘Kaathu Kaathittu‘ and its instrumental arrangements are lots of fun. I am not so fond of ‘Kayalirambilu‘, but it fits well into the film. These songs are not interruptions but serve to take the narrative forward. These are the reasons why the journey up to the climax is so rewarding and insightful, and it is possible to excuse the pat, simplistic and therefore implausible ending perhaps designed to make the film more viable at the box-office than if the climax had been open-ended or ugly. Paipin Chuvattile Pranayam is a sweetly sad film that transports the viewer to its world and provides a convincing portrait of the social milieu it inhabits. It adds Domin D’Silva’s name to the list featuring the likes of Dileesh Pothan, Althaf Saleem and Lijo Jose Pellissery who are redefining commercial Malayalam cinema.